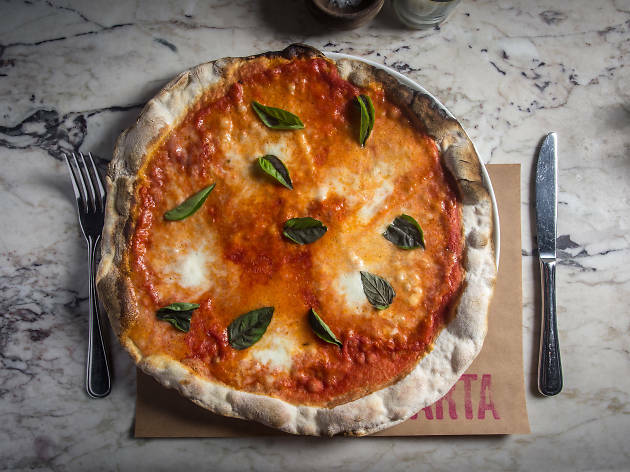 Danny Meyer's getting into the pizza game—the restaurant mogul (Union Square Cafe, Shake Shack) has teamed with his Maialino chef Nick Anderer for this rustic Roman pizzeria inside the Martha Washington Hotel. A self-proclaimed Rome fanatic, Anderer fell in love with the capital city's thin, crackly-crusted rounds, which he pulls from two wood-burning ovens and a nine-foot-long over-embers grill. “It’s so light that the pizza becomes part of the meal rather than the entire meal itself,” he says. “The dough is a blank canvas for seasonal flavors.” Along with the traditional pies (Margherita, Napoletana), the toque turns out outré renditions like an okra-and-lamb-sausage number and one with pecorino, crumbled potato and crispy guanciale. The two-level restaurant, which features a mezzanine with bird’s-eye views of the main dining room below, is anchored by an open kitchen slinging more than just pizza: Expect rabbit meatballs, beer-brined chicken and butterflied trout saltimbocca presented on hand-painted ceramic dishes and custom-made butcher blocks. As a general rule of thumb, hotel restaurants are usually to be avoided at all costs. Marta is the rare exception though, and there's a reason that it was once impossible to get a reservation. Even two years after opening, it's still a crowd favorite. We went on a Monday night and there wasn't an empty seat in sight. Don't get me wrong, I love a good dollar slice from time to time (read: at 2 AM). But fancy pizza has its place too. 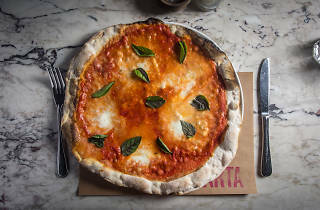 Marta's pies come thin crust (Roman style), with that perfect charred outside that you can't exactly get at Two Bros. (unless it's dirt from the counter). The menu features protein entrees in addition to the 'za, but if you want a piece of meat you should have gone elsewhere. The pies are where it's at. My most recommended would be the salsiccia, which comes loaded with pork sausage, and the funghi, which I think they're most famous for. I'm going to agree with Anna below me and say this place fell a little short of my expectations. I came for the pizzas and while they weren't bad, I wouldn't come back for any unless I was in the area. The pizzas were very cracker-like, which I didn't love. They are affordable though and they have a great wine list, so it's a good place to go for a few drinks and some bites. Disclaimer: I have high standards when it comes to Italian food. Although the appetizers and the pizza that I had were acceptable, I have to say the food was a bit boring. I was expecting more creative takes on old classics and ended up with decent, traditional dishes. Bonus points: The space is stunning. I had no idea this was one of Danny Meyer's restaurants, or my expectations would have been higher. However, I was impressed and pleased anyway, so Mr. Meyer should be proud. Marta is housed in a beautiful, large, see-and-be-seen room on the ground floor of the fabled and newly remodeled Martha Washington Hotel in the Flatiron District. The menu is predominantly individual brick-oven pizza, both red and white versions, and there are also entrees in the northern Italian tradition. The Pancetta e Fagiolli (ham and beans) appetizer had a rich, smoky flavor that reminded me of the wild boar I'd had in Tuscany years ago. The pizza crusts are light and crisp, and all the ingredients are top shelf, but they were a bit oversalted. There's also a great wine selection. A large, Friday night birthday party is probably not the best scenario in which to judge the wait staff, but the service was not overly attentive. I don't doubt smaller parties get excellent service. The prices were high, but not out of line with other upscale NYC eateries. I went here last night for a friends birthday and I'm usually skeptical about eating at places in "midtown" but this place was very good. This is the kind of restaurant where you look at the menu and have no idea what anything is; however, this did not stop up from ordering every antipasti dish they had (I know ballers). The two salads, the risotto logs (they literally look like turds), the squash bread creations and the chicken meatballs. You really can't go wrong, It's a tad pricey but well worth it! There was one awkward moment when we ordered the truffle pizza and the waitress politely informed us that it was $65 - we promptly cancelled that order. It was awkward but I appreciate her watching out.